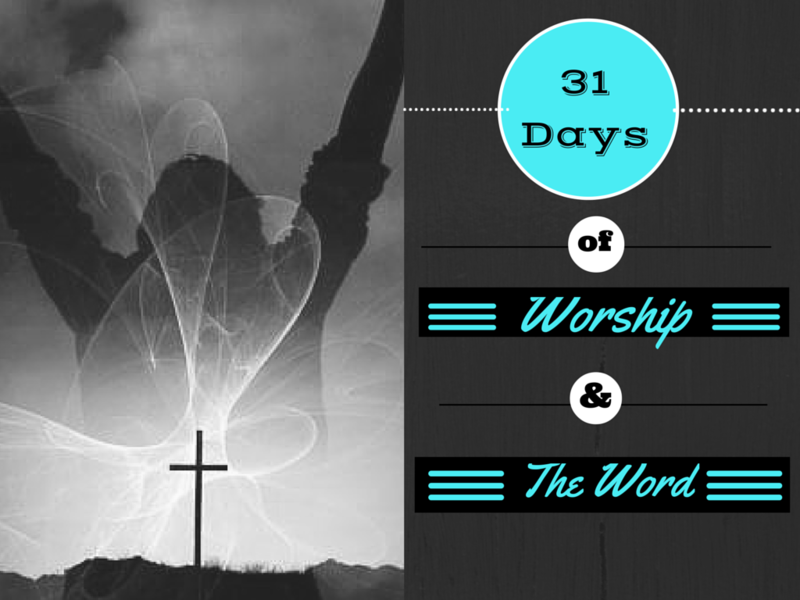 31 Days of Worship & The Word: Day One: Praise Him!!! Today begins the 31 Days Challenge (f/k/a Nester’s 31 Day Challenge). For more information on this challenge, please visit http://write31days.com/. As I shared yesterday, I feel like the devil has been getting the best of me lately. My eyes seem to be on me, my problems, and my enemies. Satan has succeeded in the last few weeks in rendering me ineffective for the cause of Christ by keeping me distracted. I know that in order to overcome Satan, my own selfishness, laziness, and ignorance, I must keep my eyes on Christ. In order for me to keep my eyes on Christ, I must take time to worship and study His word. In Lysa TerKeurst’s book Becoming More Than a Good Bible Study Girl, she shares that where there is praise, there is God, and where there is God, there is no Satan. So, when we feel the “grumpies” coming on or we feel under attack, we should just stop and praise. Praise God, it really is that simple. For those of you doubting, I ask you to try it. I think it will surprise you just how fast this works. It is my hope that you will read a post in this series every day this month. I want you to wake up praising God. I am curious to see what God will do in my own life if I wake up everyday and first sing His praises. If you join me, I would love to see how it works in your life. Today I chose Praise Him by The David Crowder Band. This one may be a little older, but it still speaks to my soul. Wherever you are, I ask that you stop and take the time right now to worship in song. Right now, stop reading and start praising! Okay, now that our souls have been awakened, let’s look at another great weapon against Satan(and our own selves): The Word. If you recall, Jesus used to scripture to fight off Satan’s temptations. I know memorizing scripture is tough, so we will do it in little doses. Since “praise” seems to be the theme of the day, I say we start there. Psalm 117: 1-2: Praise the Lord, all you nations; extol him, all you peoples. 2 For great is his love toward us, and the faithfulness of the Lord endures forever. Praise the Lord. There are a few areas of my life I have become lazy in too. I have not been eating as healthy or exercising as regularly as I was two years ago and it shows! I imagine in the spirit realm when we don’t feed on the word and exercise our spirits in praise our souls end up carrying around baggage they were never created to carry. I am doing a week long challenge from another blogger not to complain this week. I am excited to see God move as my praise goes up unhindered by bouts of complaining. Nice post! I look forward to reading more.